Is this a Pothos Jade? Anyone know? I haven't seen one like that so large with little or no variegation. Only mature Goldens and Marble Queens. The only yellow on these seems to come from distress. I happened upon the pic when searching for something else. Re: I'm glad I caught your post! Posted by jay-mid-md on 10/16/2018, 8:45 pm, in reply to "I'm glad I caught your post!" Me too this year. I have lots of photos from the summer to go through and many to share, I'll probably do that this winter. 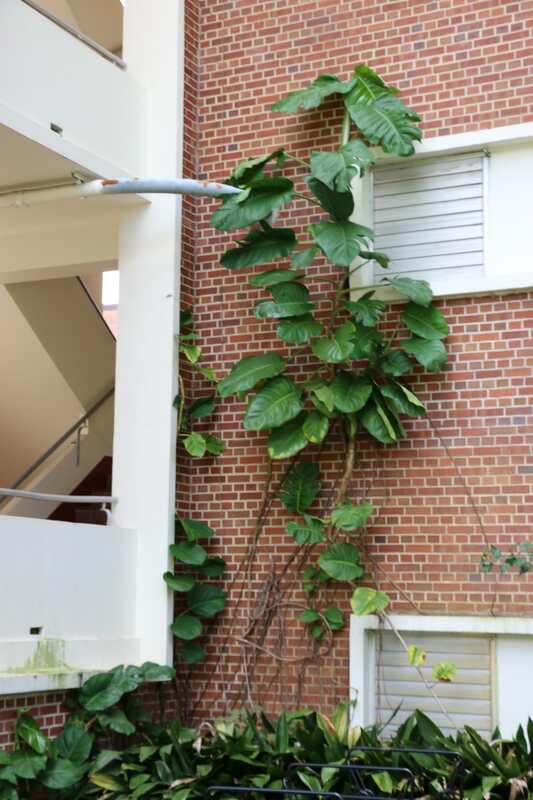 That's the farthest north I know of any Pothos (Epipremnum aureum) outdoors. I have a few small Pothos vines that reverted to solid green from a Pothos Golden. They look like Pothos Jade which is my guess on what that one might be. That's good to know. I'll consider UF as a place to visit the next time I'm within a 2 hr radius of it. Posted by Alex NYC on 10/21/2018, 1:11 am, in reply to "Re: I'm glad I caught your post!" Jade Pothos sounds like it fits the description of that vine! UF definitely has some cool finds. Until last year they had a huge papaya tree (it died in the cold last winter). It must have survived several years in it's location near a tall building. If you're ever close by, Kanapaha Botanical Garden and Cedar Lakes Woods and Gardens are great places to check out. Both botanical gardens play it safe with their palm choices, but are beautiful spots! UF definitely has pushed the limits for plant selections by McCarty Hall. They're growing pretty much every palm I could think of wanting to try in a zone 9a without any cold weather care that I'm aware of. UF in general is much palmier than the rest of town mostly because a lot of people in North Florida prefer oaks over palms.